Hearing the recent news that 11 year vet Brian Robison has been released. So instead of writing about why he was, and how we have to trust the process, I'd rather look back on a player that I've looked up to for many years. Robison was drafted to the Vikes in the 4th round of the 2007 draft. ( That's not a typo, he really has been in MN that long) Spent his first couple years as a back up. Getting his shot after the departure of Ray Edwards, Robison took his spot among the starting front four. Didn't take long for the long haired Longhorn to make his mark as a pass rusher. Combining with the likes of Jared Allen to create quite the pair of bookend DE's. As the years went by, Robison became a Fan favorite. 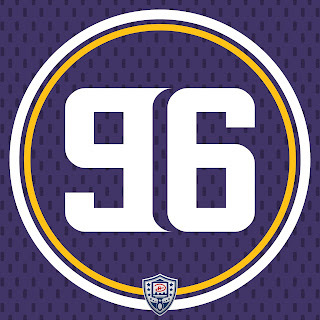 Launching 96 questions on Vikings.com, adding flair to his sacks with the Reel 'em in celebration, and most importantly never taking his profession for granted. I can't tell you how many times I've seen Robison interact with fans. Be it over social media or in person, B-Rob always had time for the fans. It's never easy to write a piece on a players release, but I chose to write this one to express my graditude for 96. It's not often a player goes 11 years with the same team in today's NFL. Hell, it's not often a player goes 11 years in the NFL period. We as fans were lucky to have a guy with such high character suit up every Sunday for the passed 11 seasons for the Purple and Horns! Here are Robison's on field stats: 289 tackles, 60 sacks, 13 forced fumbles, and 1 TD. One stat you won't find on any stat line is what he has done outside of the game of football. The Reel em In foundation maybe Robison's most impressive stat of all. We all have seen the awesome merch and the fishing tournaments Robison has done. What we don't see is the countless hours he has spent creating a foundation that provides financial assistance in the training of law enforcement K9s. On behave of the crew here at VikingNations, we thank you Brian Robison for being a true professional in every sense of the word. No matter where life takes you, you will always be a Viking!